More than ever, infectious diseases are an issue of international importance. However, related research, increasing knowledge and technologies often bear dual-use aspects as an immanent risk of misuse, e.g. for development and proliferation of biological weapons. In this chapter, relevant programmes, regulations and binding international agreements are introduced to give an overview of activities concerning bio-nonproliferation. Definition of dual use research of concern (DURC). 2013 [cited 2017]. Available from: http://www.who.int/csr/durc/en/. John Hart RT. Science, technology, and the biological weapons convention. 2012 [cited 2017]. 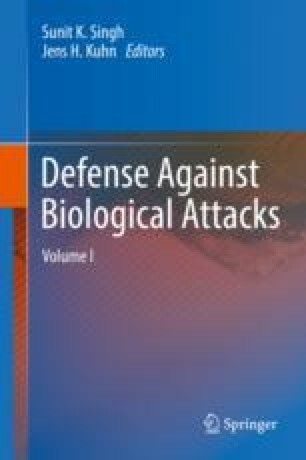 Available from: https://www.armscontrol.org/act/2012_10/Science-Technology-and-the-Biological-Weapons-Convention#hart. Geneva Protocol. [cited 2017]. Available from: https://unoda-web.s3-accelerate.amazonaws.com/wp-content/uploads/assets/WMD/Bio/pdf/Status_Protocol.pdf. Biological and toxin weapons convention. [cited 2017]. Available from: http://www.unog.ch/80256EDD006B8954/%28httpAssets%29/C4048678A93B6934C1257188004848D0/$file/BWC-text-English.pdf. Regional groups in the biological weapons convention. Available from: http://www.unog.ch/80256EE600585943/%28httpPages%29/73C3C49BEA5621A0C12572DB00477B4A?OpenDocument. The confidence building measures (CBMs). [cited 2017]. Available from: https://www.unog.ch/80256EE600585943/(httpPages)/5E2E8E6499843CCBC1257E52003ADED4?OpenDocument. Findlay T. Verification and the BWC: last gasp or signs of life? 2006 [cited 2017]. Available from: https://www.armscontrol.org/act/2006_09/BWCVerification. Bansak KC. Enhancing compliance with an evolving treaty: a task for an improved BWC intersessional process. 2011 [cited 2017]. Available from: https://www.armscontrol.org/print/4902. BWC meeting of states parties (10–14 December 2012). [cited 2017]. Available from: https://www.unog.ch/80256EE600585943/(httpPages)/89835CB0A2DAA4A0C1257B6E003415C5?OpenDocument. Eighth Review Conference of the States Parties to the Convention on the Prohibition of the Development, Production and Stockpiling of Bacteriological (Biological) and Toxin Weapons and on Their Destruction. 2016 [cited 2017]. Available from: http://www.unog.ch/80256EDD006B8954/%28httpAssets%29/F277FA6A2B96BA98C125807A005B2F59/$file/2016-1129+Final+report+adv+vers.pdf. Seventh Review Conference of the States Parties to the Convention on the Prohibition of the Development, Production and Stockpiling of Bacteriological (Biological) and Toxin Weapons and on Their Destruction. 2011 [cited 2017]. Available from: http://www.unog.ch/80256EDD006B8954/%28httpAssets%29/C2BAA955E58E15C7C1257D01005260D3/$file/BWC_CONF.VII_07.pdf. Convention on biological diversity. Available from: https://www.cbd.int/. Nagoya Protocol. Available from: https://www.cbd.int/abs/nagoya-protocol/. Access and benefit-sharing clearing-house. Available from: https://absch.cbd.int/. Smallpox. [cited 2017]. Available from: http://www.who.int/csr/disease/smallpox/en/. Security Council Resolution 1540. 2004 [cited 2017]. Available from: http://www.un.org/en/ga/search/view_doc.asp?symbol=S/RES/1540%282004%29. Security Council Resolution 1540 (2004) [on non-proliferation of nuclear, chemical and biological weapons]. 2004 [cited 2017]. Available from: http://unbisnet.un.org:8080/ipac20/ipac.jsp?profile=voting&index=.VM#x0026;term=sres1540%20(2004)#focus. Australia Group. [cited 2017]. Available from: http://www.australiagroup.net/en/. CBW Events. [cited 2017]. Available from: http://www.cbw-events.org.uk/. Global Health Security Initiative (GHSI). [cited 2017]. Available from: http://www.ghsi.ca/english/index.asp. Global Health Security Initiative. Available from. https://ec.europa.eu/health/preparedness_response/cbrn_threats/ghsi_en. Global Health Security Initiative (GHSI). Available from: https://www.phe.gov/Preparedness/international/ghsi/pages/default.aspx. Kickbusch I. Global health – a definition. Available from: https://www.ilonakickbusch.com/kickbusch/global-health/. EU CBRN risk mitigation centres of excellence initiative. Available from: http://www.cbrn-coe.eu/. CBRN Centres of Excellence. Available from: http://www.unicri.it/topics/cbrn/coe/. Global Health Security Agenda. [cited 2017]. Available from: https://www.ghsagenda.org.